Looking for great fall wedding ideas? There are plenty of autumnal themes out there that you might fall in love with for your wedding (fall in love…pun intended!). And many ways to incorporate them into all of the details of your special day. Your fall wedding ideas can start with the invitations and go all the way through the bridal party attire, ceremony décor, reception centerpieces, favors and even the food! Since the wedding invitation is still the first glimpse of the actual wedding that your guests get to see, you’ll want to choose something that at least lightly reflects the autumn ambiance that the wedding itself will boast. Colors and motifs are the best way to incorporate your fall wedding ideas into your printed invitations. Look at beautiful color combinations like chocolate brown, burnt orange, ivory, burgundy and even eggplant for the invitation paper, inner envelope, inks or accents such as ribbons and charms. An obvious way to help autumn make an impact on your wedding is to carry the theme through the choice of attire used for the bridal party. Bridesmaids can wear dresses in fall tones and slightly heavier materials. They can be further embellished with items like themed brooches, hair accessories and fall styled jewelry (ie, delicate necklaces with beautiful fall leaf charms…attire and gift, all in one!). Gentleman can dress up with traditional black tuxedo suits, with vests and ties in autumn hues. 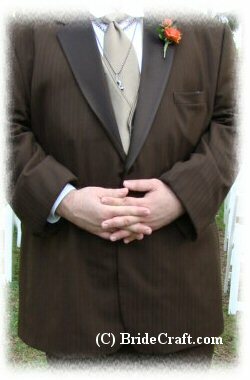 They could event skip the black tux and go for a slightly less serious suit in a rich brown color. And of course, the ultimate accessories are the bouquets and boutonnieres. An incredible array of fall flowers exist, and their colors and textures will help to complete the bridal party look. The ceremony is another place to incorporate many beautiful fall wedding ideas. The alter can be an arch covered in fall leaves and flowers, a chuppah that uses rich burnt orange chiffon fabric draped over it, floral alter arrangements brimming with a fall mix of flowers and leaves, etc. 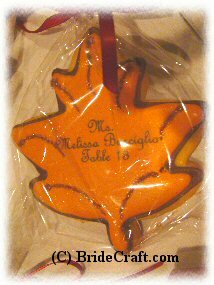 If you are so inclined, you can even work the most famous fall seasonal produce of all, the pumpkin, into your ceremony. Clustering them along the aisle in different sizes with bunches of dried fall leaves and some fully bloomed rose heads would be colorful, lush and beautiful all at the same time. But while the ceremony is the reason for the whole event, the reception is a chance to really get creative with your fall wedding ideas. The wedding reception has many ways to bring your autumn theme into play. Color is still your main tool. Use linens to bring dramatic color onto the tables. If it’s within your budget, hire a lighting company to wash the reception hall walls in amber up lighting. Centerpieces are the obvious way to bring the season into the reception. From spicy scented candles, pumpkins, fall leaves, branches with hanging votives, fall hued floral, wheat and more. The ideas and combinations are nearly endless. Beyond linen, lighting and centerpieces there is another way to bring fall wedding ideas into play. 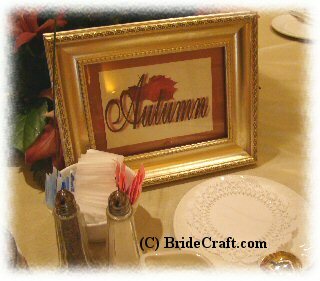 Favors are another oft forgotten area that could display your love of autumn. This is the little token of appreciation that your guests take with them after your wedding is over. Send them home with a wine stopper emblazoned with a fall leaf, or a petite bottle of wine that are appropriate for the season. Edible treats are always a nice favor, and candy always makes for a sweet treat. Give a seasonal classic like candy corn, or try something a little richer like dark chocolate. Make it more personal by giving cookie cutters with your grandmother’s recipe for pumpkin cinnamon cookies. It’ll give your guests something to enjoy after the wedding. Autumn is a beautiful time of year for your wedding celebration. And if you’re a fan of the season, then you’re sure to find some inspiration from the above ideas. Remember to bring your own creativity into action when coming up with your fall wedding ideas.